Experience Bend’s vibrant, local community with Bluebird Day Vacation. The Criterion House is a gorgeous 3 bedroom, 2.5 bath contemporary home located on Bend's popular Westside in the desirable Newport Landing Neighborhood. Located just off Newport Avenue and College Way, this Westside Location is fantastic! Just outside your door you can walk to fun restaurants and coffee, Newport Avenue Market (the locals' favorite) and more shops and restaurants are an easy 6 blocks away. Hop on one of the cruiser bikes provided and explore Bend like a local! The Criterion House features an open floor plan that is great for families and friends! Cozy up to the gas fireplace and watch a movie on one of two HUGE HDTV's and watch anything on Netflix, or make a gourmet meal in the fully stocked kitchen featuring stainless appliances and gorgeous finishes. There is sit down dining for 8, along with 3 seats at the breakfast bar, plenty of room to accommodate. Enjoy outside living “Bend style” while you and your friends cook out on the gas grill and enjoy dinner on the covered patio surrounded by native landscaping. If you prefer to get out into nature, there are plenty of hiking and mountain bike trails just minutes from town. The super-fun Phil's Mountain Bike Trail System is an easy 3 mile ride away! Mount Bachelor Ski Resort, the spectacular Cascade Mountains and lakes are and easy 20 - 25 minute drive. Getting there from the Criterion House is a snap! 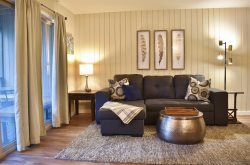 All of our Bluebird Day homes feature super comfy beds with European style down bedding, fresh and clean duvet covers and high thread count linens, free wireless internet, a washer and dryer, complete cable, HDTV, free Netflix, games, and much more for you to discover! • Open floor plan perfect for family and friends! • Brand new ultra-comfy beds!! Great location, plenty of space, comfortable! Our family spent an extended weekend in Bend, hiking, downhill skiing and visiting with relatives. The house is conveniently located near Newport Market (groceries), restaurants, breweries and downtown. Its only a half hour to the slopes at Mt. Bachelor. The house was clean, the space well laid out for gathering with a group as well as for privacy. We would definitely stay here again. The Criterion home is roomy, comfortable, nicely appointed, well equipped and we loved it! 6 of us had plenty of room to spread out, and also the room to get cozy and eat meals, play games, etc. We had everything we needed, and numerous invitations to communicate with Bluebird Day if we needed anything. We did not have the need! Close to dining, shopping, ski shops and skiing, the location was perfect for us. Highly recommend the home and Bluebird Day. Bluebird Day is super easy to work with and are very responsive and available. The house is just great. We have three kids and it works perfectly for us. It is warm, comfortable and spacious. Great location as well and nice neighborhood with friendly neighbors. We had a great time!! Criterion House is truly a home away from home. Great location, spacious, everything you need is in the property. Looking forward to returning! The house is in a perfect location. Very nice house. Easy to use. Easy to drive to and from. Rebecca is super helpful at Bluebird Day Vacation Rentals. Great house and great rental company. Absolutely lovely home with everything we needed. Close to town but far enough away to be nice and quiet. It was really cold when we were there and fireplace was awesome! Very trendy and clean! Excellent location. Lots of space and comfortable beds. We had a great time entertaining our guests from Brisbane, Australia, in this lovely 3 bedroom home on the west side of Bend. Our guests were delighted with the home which provided a secondary living room, fine laundry facilities, a great kitchen, and was comfortable for 6 of us. We appreciated the proximity to downtown, the highways out of town to points of interest, and the quiet neighborhood. It was just the most perfect place for our family on our skiing trip. It was close to the city where we can walk to restaurants and only a 25 minute drive to Mount bachelor. The house was marvelously clean and well stocked. We will definitely come back again! We thoroughly enjoyed our stay at the Criterion House in Bend. We are a family of eight; Grandparents, parents and two preteens. We chose this home based on size, layout and amenities inside the living quarters, and we were not disappointed. After spending all day skiing Mt. bachelor we were able to come back, make dinner and enjoy quiet family time with Plenty of dining seating, and room for all eight of us to relax together in front of the fireplace. Beautiful kitchen and top notch linens. The beds were very comfortable, and the upstairs loft was great for the two grandkids to entertain themselves. We enjoyed riding the bikes down to Newport Market. This is a beautiful home and the location was just far enough away from the downtown hub. This is our fourth trip to Bend, but the first in the winter. Rebecca was very pleasant and we will be seeking out a "Bluebird Vacation Home" again when we come back this summer! Criterion Home was a home away from home! Great location! Nice and quiet! New home with all the comforts! Bluebird was wonderful to work with! We hope to be back! HIGHLY recommend! Excellent! The house had everything we needed and more! Spent a lovely Thanksgiving with our family. I would recommend it highly to anyone for a summer or winter getaway Great location and lots to do around the area.. Perfect! Perfect! Perfect.. Rebecca made it so easy! Definitely would stay here again. Great amenities, clean, comfortable and convenient. Perfect location for easy drive to the mountain and we could safely store our gear in the garage. Easy walk to Newport Shops & Drake Park. Great house. Like new house, everything we were looking for. Really happy! Thanks. My sister, niece and my 2 daughters rented this house for a girls weekend. We found it perfect for our needs. The house was impeccably clean and had every amenity that we could have wanted. Everything about the house is great. Good size and layout for any occasion. Would be nice to get a hot tub upgrade but that is probably the only downfall. It is about a 12-15 minute walk to 10 Barrel. Its a little on the outskirts of the perfect location but worth it for all the updated amenities. I would highly recommend this house to anyone. Its really nice for the price.